I ended up cooking it for nine hours and it was simply ‘marinated’ for half an hour in a simple bottled chinese marinade. So how did it taste? 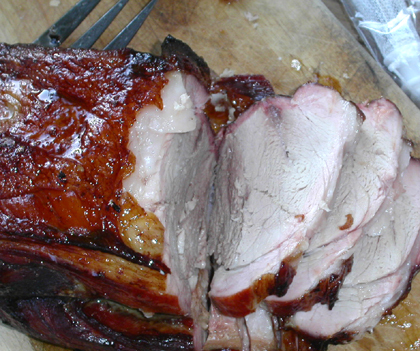 Pork shoulder is a very cheap cut of meat partly because it pretty much has to be slow cooked. Regular techniques mostly just dry it out. I can tell you that sealing it in some way – as with this glaze/marinade – holds the moisture even better. You can see from the photo above that there was a goodish layer of fat around the top and that is the other key. Everyone – even the super-skinny dieting, health-conscious people – all agreed that the fat was a key component, even in the eating. I can tell you that hot smoky, runny pork fat is very good indeed! I had hoped for leftovers but the news got out and we ended up with fourteen people and then the dog got the bone. It is time for the 20th Paper Chef Event. But this time since it is Paper Chef 20, we are also making it Paper Chef 2.0 – a revised version of the event with an adjustment to the ‘guidelines’. The reason for the update is that we have discovered that certain people have been a little reluctant to take part because of some of the more extravagant creations that other entrants have come up with. We want everyone to take part and to enjoy taking part. About a week before the event opens, I post an ingredient list from previous events here at Tomatilla! Older ingredients fall off the list, as does anything that actually got used in an event. Those ingredients are ‘banned’ for a month just to prevent the choices being cream and chocolate and cream and chocolate and cream and chocolate and…you get the idea. Any reader of the blog can nominate a new ingredient (one nomination per month per person please) and it can be anything within the bounds of good taste (both kinds). Three ingredients are chosen at random from the final list and the host (usually me but not always) picks one more ingredient that is topical or seasonal or that suits our whimsy. Then you get a weekend (Friday Noon to Monday Noon) or more to make up a recipe, cook it and post the recipe to your blog. Then post a comment here or send an email to owenl1998 at yahoo dot com to be included in a roundup. Optionally, if you are up to speed on these things there will also be a Technorati tag to place on your post to make it easier for everyone to find posts. There are now always a couple of base categories and optionally additional categories per month at the discretion of everyone involved â€“ the host, the judge and even the entrants get to suggest a category or two (but please, let’s not go completely insane here). The two basic always present categories are Paper Chef Haute intended for the fancier more complex entrants worthy of a place on the table at your favorite gourmet restaurant; and Paper Chef Home intended for entries that are reasonable to expect any cook to make in a home kitchen for a daily meal without having to scour the universe for ingredients. You are welcome to enter one dish in both categories or multiple dishes in multiple categories. The previous month’s winner gets to be judge if they want (and is ineligible to win that month but can still enter) and gives out whatever kinds of awards they like. It is also OK to NOT want to judge, in which case I’ll find a judge of some nature for that month. It is also absolutely OK to substitute if you just cannot find an ingredient or if you or someone who will eat the dish has an allergy – just try to substitute with something close to the original to remain in the spirit of the occasion. We know that ingredients are freesh and in season at very different times in different places around the world. The times are always the first Friday of the month, Noon PST until the following Monday Noon PST. Someimtes there is an extension because of holidays or special circumstances. We aren’t sticklers for timekeeping here – a little late and any excuse will do. A LOT late and you’ll have to have a really good and creative one to do with cats pushing bowls off counters or the like. So, ingredient nominations for the 20th Paper Chef are now open. The current list to start us off is below. It’s hot! The past week daytime highs have all been over 100F and nightime lows have still been mid-70s. We don’t have real air conditioning and at night we open all the windows wide and run an industrial strength fan. So we have been looking at ways of not cooking – the best ones involve cooking outside and the best by far is the smoker. I use a Char-broil charcoal and water smoker. It cost me $25 many years ago and can still be had for less than $40. It is fuelled by charcoal (or wood) and the temperature is moderated by a pan of water that hangs over the heat source. Basics are that you start up the charcoal in your chimney starter (you do use a chimney starter, right?!) and then dump them carefully but very quickly into the bottom bowl of the smoker. Then you install the water bowl above that and then slide in the grill rack above that and put your meat on top. Cooking time is LONG. Usually 8 hours or so and I typically start it in the morning and check it every hours and a half, adding more fuel, rotating meat, etc. But that assumes I am home. So now I have a new overnight technique. I start a really big load of fuel at about 10PM, put the meat on, reload fuel at 12:30 (just after midnight, my usual bedtime) and turn the meat. Then I go unload when I get up at 6 or so. Recently I did a whole 5-pound chicken, four pounds of country-style (no bone) pork ribs and six pieces of Indian-marinated chicken. The meat lasted us for a week essentially. 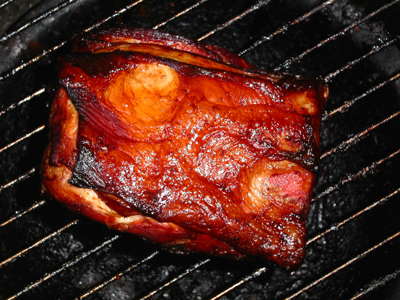 Now – this technique isn’t truly smoking – it is a little quick and a little hot (that big load of fuel starts to roast the meat). And I have discovered that I like this blended technique. So today I got a 5 pound pork shoulder, one of my favorite slow-roast cuts of meat, marinated it quickly in a sticky soy, garlic, sesame, plum-sauce chinese marinade and put it on to roast before I left for work. It will be turned at about 2PM by someone and when I get home at 6:30 or so I will crank up the flame and hot grill/roast/crisp the outside for about ten minutes. Hopefully I will have pictures for you…. But I also appreciate Magic Tofu‘s point that we shouldn’t restrict people to a singel category. Plus I have enjoyed especially the Paper Chef’s where judges make an effort to add in new categories. So we are going to end up with two or three mandatory categories and then the option to add more each time. I’m also going to redo the little badge that I have stopped sending to winners and make the photoshop layer files available so people can update and build their own badge if they want one. And, heads up, Paper Chef 2.0 will start August 4th 2006! It’s time to try to get back into the blog again. Looks like Paper Chef kind of fell through the cracks – we have some entries though so I’ll do a roundup in the next couple of days and ping our last month’s winner to judge the entries and then I’m going to take up the reins with some changes. It seems like there are several categories of people who like Paper Chef. But there are two main groups. One is the group that likes to challenge itself very seriously to stretch the boundaries in what they do and use a great deal of technical culinary skill to produce some pretty astounding creations. The other (to which I belong) is a little intimidated by the first group and really just wants some creative kickstart for making a different meal. I was further convinced that this is a common culinary dichotomy when dipping in to Heat by Bill Buford over the weekend (thanks Mum!) and realising that most places you go out for a meal want to serve you a good dinner but the chefs he describes, like Mario Battali, want to create an unforgettable experience. It is like contrasting wanting to have a good, comforting poached egg on toast with wanting to serve an egg poached in white truffle oil in a lacy, crisp, chickpea flour cup with dots of chive oil and a morel sauce. Both are worthy aims, but most of us live day-to-day in the world of the scrambled egg – let alone the poached egg. So we are going to have categories in Paper Chef from now on. The first, to satisfy the wildly competitive of the world will be the ‘haute’ category – competitive, wild, outrageous and very refined all at once. For special occasions. The second will be the ‘home’ category – something you make for a meal on a working weekday. And the third will be non-competitive – all may enter and all will win.